they point at you and whisper, then you hack them to bits. Was that a hot air balloon? ...or did I also miss it? Ok no one said it exactly so I'll ask, how do you get the Walter head. That sounds sooooo freaky, I just have to try it! You mean the floating head outside the window? It's not Walter's, it's Andrew's. Yes, its the Robby hot air balloon you can see floating outside the window. I missed it! Isnt the "im always watching you" voice caused by the telephone being haunted? In Room 302 of the Past. I never have gotten the phone haunting or the part with Walte's face in the church painting. (I never have picked up the doll he gives me on any one of my 90 playthroughs.) I saw a vid on youtube about it and indeed he does say "I'm always watching you" in a continuous loop. As for the robbie head baloon it seems to be in different places outside.. sometimes its above the building across the street.. and others right by the billboard. What is odd is.. on my later playthroughs I never encountered 1 haunting at all throught the game. Why did the hauntings disappear for me? I think I was on a special mode of some kind... not one weapon mode but the one you get for beating 1 weapon mode on hard and get 10 big stars. Though I'm not sure. Yep, that's Walter's voice. I believe it's coming from the phone. Yeah. Happened with my first play-through. I found it to be the creepiest haunting. I didn't look at the church painting, So I don't know about Walter's face coming out of it, but I do remember a shadow of a child which was cast on the closet wall by the bed. Creepy stuff. That ' I'm always watching you ' goes with the phone haunting. When the painting is haunted we can hear crying of something like lion and then painting changes I believe. Dang, I've played through this game three times, and I missed all of that? Well, there is only one way to solve this. Play through it four times! 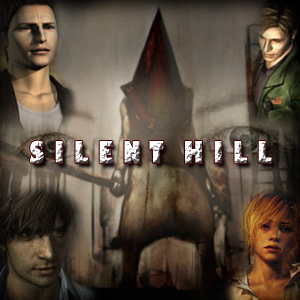 My favorite was when you look in the wall of the girls room the bunny is facing West then when everyone in the "Real World" think shes dead he faces you pointing at you (South) I love that my favorite part of the game PATH TIC!